An incredible three-pointer, matched by an incredible three-pointer at the buzzer. 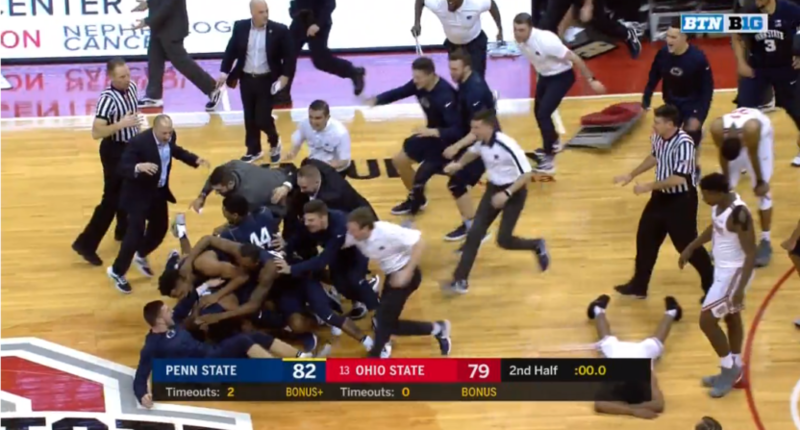 The Penn State Nittany Lions and Ohio State Buckeyes just provided one of the craziest finishes in college basketball this year, with Penn State ultimately coming out on top 82-79 on a crazy buzzer-beater. Trailing 79-76, Ohio State’s Keita Bates-Diop nailed a highly difficult three-pointer to tie the game and make the home crowd go bonkers. And just seconds later, the Nittany Lions’ Tony Carr responded by banking in a three from way downtown, to give Penn State a buzzer-beating victory over the No. 13 team in the nation. The Buckeyes entered the game as 10-point favorites and were undefeated in Big Ten play (now 9-1). Penn State moves to 4-5 in-conference with the win. And that insane finish is very similar to the conclusion of a recent Stanford-USC game.